As Londoners’ addiction to cocaine rises, water quality decreases and wildlife feels the effects. But what are the implications for human health? England and Wales have the highest drug consumption amongst young people in all of Europe. This study reveals that use of cocaine in the capital is now prevalent during the working week, whereas previously it was higher on weekends and lower during the week. In fact, iNews reports that roughly 80,000 lines of coke pollute the River Thames each day,(2) and species that live in the river are paying a high price for Londoners’ drug use. Why is cocaine in water? It’s not just cocaine; anything humans ingest can make its way into our waterways, from cocaine and other illicit drugs, to prescribed medicines and hormonal treatments. Anything our washing machines flush out also makes its way there, including plastic fibres from clothing such as fleece. Human behaviour contaminates our most precious resource, water. Does this have implications for tap water? “Since our water supplies are in part recycled, processed water, then it follows that what goes around comes around.” Roger Wiltshire, M.D The PureH2O Company. Sadly, we know that UK tap water contains a wide variety of pollutants resulting from human behaviour, as well as naturally occurring impurities. These include traces of cocaine as well as other drugs, medicines and hormones. Plastic fibres are also present in tap water, thanks to single-use plastics pollution and the washing of man-made clothing. Pesticides and fertilisers used by the agricultural sector are also found in tap water, as well as chemicals from industry and a variety of micro-organisms including those associated with the development of Alzheimer’s disease. Just because water utilities aren’t taking sufficient responsibility for removing drugs and other pollutants from our water sources – and from the drinking water that comes out of our taps – doesn’t mean all these contaminants and impurities are a fait accompli you have to accept. Read on the for the alternatives. Don’t rush out to buy a water filter. Comparison of Tap Filtered, Bottled and Pure Water in terms of total dissolved solids. Don’t bother with bottled water, either. Think bottled is the answer to safe drinking water? Even if you could put to one side the devastating impact of single-use plastics production and pollution on the environment (which no-one ever should, let’s face it), bottled water is a poor choice. It’s even more contaminated with microplastics than tap water. 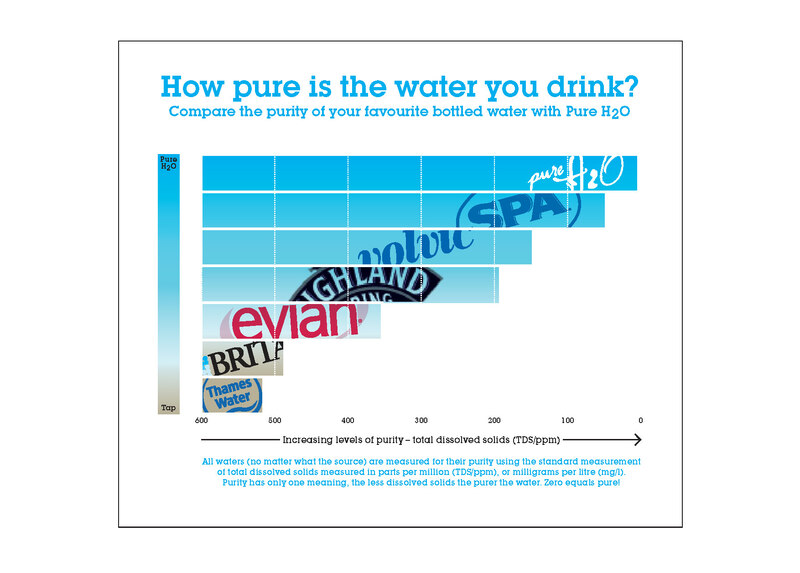 Water Purity is possible, with PureH2O. Yes, humans are having appalling effects on the environment. Tap water and bottled water contains contaminants and impurities that may have a negative impact on human health. But safe, sustainable drinking water is not an impossible dream. Water purification in your home is easy, convenient and affordable with the PureH2O Purity range of tap water purifiers. Designed to treat UK tap water, they remove up to 99.99% of all contaminants and impurities to deliver unlimited quantities of safe, sustainable pure drinking water day in, day out. We have a range of models to suit your needs and budget, and commercial configurations, too. You can read more about our Purity advanced water purification systems here and purchase online, too. Alternatively call us on 01483 617000, we’d be delighted to answer any questions you may have.